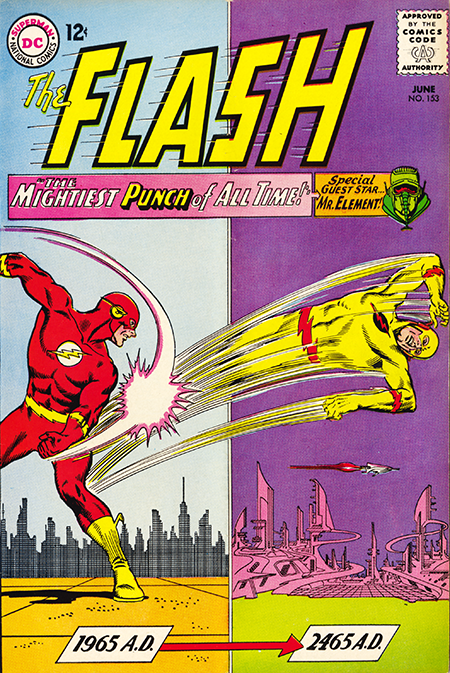 Eobard Thawne, AKA the Reverse Flash, AKA Professor Zoom makes a return appearance from the future and begins to stake his claim as as one of the Flash’s more enduring villains with another book-length adventure (I know we all thought Grodd was going to assume the residency of the all-time-evil villain spot, but there you go). The story opens in the future where PZ has outwitted the prison’s brainwashing system and has been set free. He immediately begins making plan to return to the past to lay one on the Flash and, at the same time, cause Al Desmond to become evil again so he can engage his alter ego the villainous Mister Element to help him. Frankly, I’m of two minds about all of this. On the one hand, it’s nice to retain the muscle memory of the previous tale and pick right up where it left off. But, on the other, you should really try to make it more than Xerox of the previous encounter which this pretty much is. That being said, it’s still a nicely told tale with six pages of patient and detailed set-up before the fur starts flying. One little twist has PZ influencing the Mayor to institute a ban against using super speed in Central so that the Flash, goody two shoes that he is, can’t use his speed to capture Zoom. But the Flash is able to lure Zoom outside the city limits so he can get back up to speed so to speak and battle him (raise your hand if you saw that coming. Hmmm… that’s not many). It does the Flash little good to have his speed back however because Zoom captures him and takes him to his headquarters. Luckily, Mister Element shows up and uses self hypnosis to save the Flash only to be overcome by evil again. After punching PZ back to the future by causing the internal vibrations that allow him to remain in the past to cease (thereby justifying the title on the cover), the Flash hops on the cosmic treadmill with Al Desmond to have the future folk brainwash him back to being a nice guy again. In the final four panels, the Mayor ends the speed restrictions in Central City, Al Desmond accepts a new promotion, agrees to get married to his fiancee, and gives her a big kiss. And it’s a wrap.